Children as young as three years of age share toy rewards equally with a peer, but only when both collaborated in order to gain them. Katharina Hamann with an international team of researchers from the Max Planck Institute for Evolutionary Anthropology in Leipzig, Germany, Harvard University and the Michigan State University found that sharing in children that young is a pure collaborative phenomenon: when kids received rewards not cooperatively but as a windfall, or worked individually next to one another, they kept the majority of toys for themselves. One of humans' closest living relatives, chimpanzees, did not show this connection between sharing resources and collaborative efforts. Adult humans produce a vast majority of their resources in cooperative work with others. Moreover, they generally try to distribute them based on norms of fairness and equity. With regard to children, previous studies have shown that when adults provide rewards as a windfall and ask children to share, 3-year-olds behave rather selfishly. However, the present studies show that even 3-year-olds do take note of whether or not rewards were produced collaboratively, which in turn affects their tendency to allocate the toys equally. Pairs of 2- and 3-year-old children had to manipulate an apparatus in order to gain toys (marbles). In study 1, they had to pull two ends of a rope at the same time in order to make a board with the marbles move towards them. Once the movement was done, children could retrieve the toys; however, one child received 3 and the other only 1. This was compared to a windfall situation without any collaborative rope-pulling but the same distribution of toys. In studies 2 and 3, children participated either in a collaboration, a windfall or a parallel work condition, with the latter requiring the same amount of work input by both children (just as in the collaboration), but now each child could pull his or her own rope independently of the other child. In all three studies, three year olds, and to some degree even two year olds, shared their toys only after a collaboration but not after individual or no work was carried out. Therefore, "the ontogenetically first sense of distributive justice may be that participation in a collaborative effort demands an equal division of spoils", says Katharina Hamann. 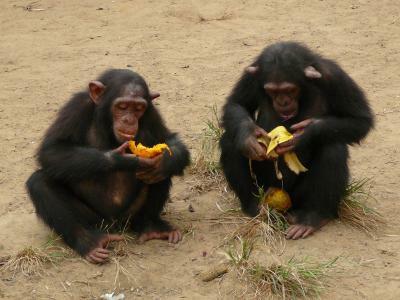 Chimpanzees, however, did not share more often after collaboration than in a windfall situation. Also in the wild, they only rarely actively collaborate for subsistence. Therefore, they may not have evolved a tendency to distribute resources more equally when those resources result from a collaboration. "Taken together", Hamann summarizes, "the primordial situation for human sharing of resources may be that which follows cooperative activities such as collaborative foraging, when multiple individuals must share the spoils of their joint efforts".